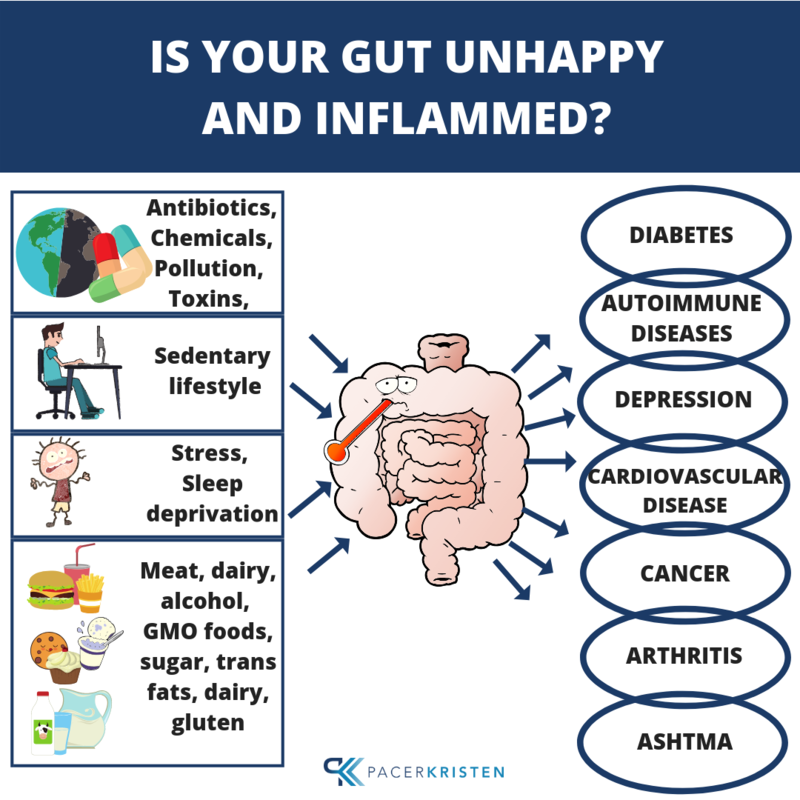 ﻿ IS YOUR GUT UNHAPPY AND INFLAMED? IS YOUR GUT UNHAPPY AND INFLAMED? Inflammation and gut health are the latest buzz words in the health field. But, do you really know what it means and how it affects your personal health? With inflammation driving the top 15 diseases, and with the season of holiday and inflammatory eating in full swing, you should have a solid plan to fight inflammation, because it starts in your kitchen, not your medicine cabinet! the slowest form of poison! Inflammation is part of the immune system and can actually be a healthy process in healing. You know this if you’ve ever fallen down or cut yourself, and the area becomes red, swollen, and inflamed. In this case, your immune system is activated to heal the wound in rapid time, and the inflammation subsides. The same is true inside your body. Chemicals and foreign, food substances cormpromise the lining of your gut and activate your immune system. Inflammation occurs internally to fight the invader, but it becomes an issue when inflammation fails to go away and the body is riddled with chronic, systemic inflammation, causing a cascade of health issues. What are the everyday causes of Inflammation? Shortly put, the Standard American Diet (SAD) causes inflammation, especially pasta, bread, meat, dairy, sugar, processed and packaged foods (think turkey, stuffing, whipped cream, pumpkin pie, and the like!). These are the same foods that generally contain high calories but low nutrients, and their lacking of color is a big tip off, especially when not balanced with healing green, veggies! Even as early as 150 years ago, the pathologist Rudolf Virchow named cancer a “wound that doesn’t heal” after seeing high concentrations of inflammatory cells within malignant tumors. Virchow was right! Systemic, chronic inflammation significantly increases risk of disease since it damages the cells of the brain, heart, arterial walls, and other anatomic structures. Over time, this cellular destruction can lead to various inflammatory chronic diseases. Top diseases caused by inflammation? How to prevent and/or diminish inflammation? Choose real foods and if boxed, canned, or packages, read labels to added chemicals and sugars. If you can’t read the ingredient, you don’t need it! Over this Thanksgiving Holiday, you can actively minimize your inflammatory response by staying clear of the top 6 store-bought foods, which contain preservatives, GMO foods (soy and corn), refined sugars, thickening agents, and chemical compounds. Canned vegetables – Cans of vegetables typically lack nutrients, have added salt, and are contained in BPA cans. Aerosole whipped cream/whipped cream – These “fun” cans have explosive capabilities and contain nitrous oxide. What’s more, high fructose corn syrup should never be on the dinner table! Boxed stuffing – Hydrogenated oil, artificial flavors, BHA and BHT (synthetic antioxidants that act as preservatives), added refined sugar, and soy ingredients lead the charge on this one! You are better off making a homemade version! None of this should ever go into your body! Flavored creamers – Refined sugar and hydrogenated oils are just scratching the surface on this one! You are better off with an almond milk creamer or pastured organic half and half with a few sprinkles of pumpkin pie spice! Canned Cranberry Sauce – To avoid this high in sugar (and made from high fructose corn syrup) traditional favorite, simply make your own with a combination of freshly squeezed orange juice and zest, cranberries, and honey, agave, or maple syrup. Gravy jars – Full of modified corn starch and caramel colors, you want to avoid this one and make your own from the drippings of your pastured turkey. I have put together my list of favorite fall and Thanksgiving recipes, which will avoid these common grocery store pitfalls and will help you to stay on track even over the biggest eating day of the year! I hope you will pick a few to recreate, and please post and tag me @pacerkristen/#pacerkristen with your awesomely healthy meals! My Move Back Into Your Body Programs are IDEAL for healing and sealing the gut and for dramatically reducing chronic inflammation…perfect anytime, and especially after Turkey Day! Programs start November 26 and December 10! Get registered now to have a plan ready for post Holiday eating. Not ready for committing to a program? I’ve got you covered! Join my Holiday Accountability group to stay on track! For just $1/day, you will have my daily support and accountability, with Holiday recipes and meal plans to minimize inflammation and maybe even lose a few pounds! Imagine heading into the New Year looking and feeling confident?